Sinn Féin activists at the unveiling of the plaque honoring six Dublin volunteers in the Spanish Civil War. 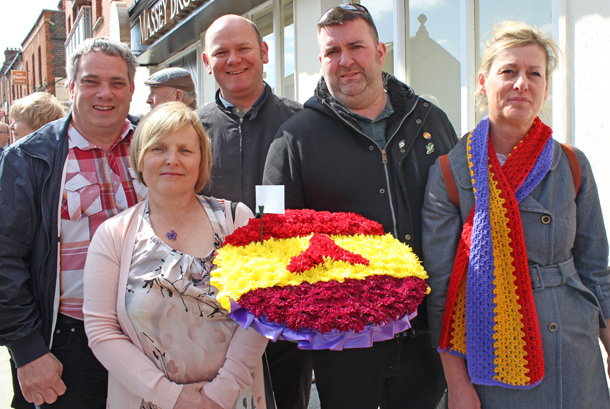 Sinn Féin activists and the families of six Dublin International Brigade volunteers gathered to unveil a plaque honoring to six local veterans of the Spanish Civil War May 4th on Emmet Road in Dublin’s Inchicore district. Over 150 attendees listened to speakers including the General Secretary of the Communist Party of Ireland, local Sinn Féin politicians, and family members of the veterans. Organizers desired to interest young people in Dublin’s role in the Spanish Civil War as well as comment on national and international politics. Speaking at the event, local Sinn Féin TD Aengus Ó Snodaigh said while the Irish Government was debating a Bill to deal with Irish Defence Forces deserters who fought with the Allies against Nazi Germany, it must also look to honour the legacy of those men who had to sneak out of the country to help defend the Spanish people against Franco. Mr. Snodaigh also thought that the memory of the International Brigades should serve as an important reminder to socialists and republicans not to be complacent as right-wing radicals garnering increasing support.